Glenda's Creative Place -Paper Crafting fun, CRICUT, CLOSE to MY HEART Consultant, Stamps, ... : Pink ATG Gun- Pre Order: $21.50 with 2 free rolls of tape!! Now here's something we can do to help with the Breast Cancer cause! Pink ATG Gun- Pre Order: $21.50 with 2 free rolls of tape!! Now here's something we can do to help with the Breast Cancer cause! Well, isn't this timely? Just after hearing the news about our fellow crafter, Monique being diagnosed with Breast Cancer, I got a notification that there is now a new ATG tape gun being offered by 3M that is PINK and the best part is that 3M will donate a portion of the proceeds of the sale of THIS item to the Susan G. Komen Breast Cancer Foundation. When I read that, I knew I had to place a pre-order for these so I could allow myself and my customers to help out with this cause. Ever since we've all heard about Monique, the most common thing I've read is how each of us wished there was something we could do to help. Well, I have to say, I believe there are no coincidences in life--which makes the timing of the email I received about this product introduction simply amazing. For those of you who are not familiar with what an ATG is, it is simply a double sided adhesive applicator. 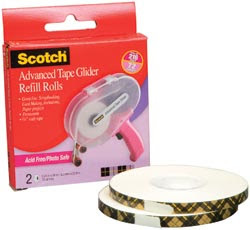 Here's a description from from 3M: The Scotch® ATG Applicators quickly and neatly apply Scotch® and 3M™ branded adhesive transfer tapes. A touch of the finger on the trigger of the unit releases the adhesive and liner for quick, controlled application of tape. No mess or clean-up. Saves time and effort. Applies adhesive transfer tape while simultaneously removing and rewinding the liner. The liner is captured on a secondary spool, leaving only the adhesive on the surface. This is the same size as the ATG 714 model (the red one) and it will hold all .25" tape designed for ATG use, so if you already have any of the tape that fits the ATG 714, that tape will also fit this new Pink unit. WooHoo!! But again, for me, the best part is that 3M will donate a portion of the proceeds from this unit to the Susan G. Koman Breast Cancer Foundation!!! 3M ADVANCED TAPE GLIDER - Pink: Suggested Retail: $26.99, my price: $21.50. Includes the Pink ATG gun and 2 rolls of .25" tape. (BTW, this is a GREAT price!!) ***3M will donate a portion of the proceeds from this Pink ATG to the Susan G. Komen Breast Cancer Foundation!!! To place your orders for the Pink ATG (and refills!) with me, please use the PayPal "ADD TO CART" Buttons above (exception--INTERNATIONAL CUSTOMERS!!). If however, you also want to add additional products to ship at the same time as the Pink ATG, or, if you are an International customer (including Canada! !--because the Shopping Cart Buttons are NOT set up for ANY International Shipping yet!!! ), please email me at mailto:address. Please include your zip code, along with your Cricut or Split Coast message board name (or from any other crafting message board, if you have one--just so I can recognize you!! ), and please put the words "PINK "ATG": in the email subject line. Also, if your PayPal account is attached to a different email address than the one you normally use to communicate with me, please include that as well, so that I send your PayPal invoice to the proper address. You've asked how you can help with this cause, so let's grab this opportunity that has literally been dropped in our laps! Well darn, I got something last week from custom crops about this and I ordered it from them.. :-( I would have ordered it from you if I had known. So sorry my friend. Any word on the cb folders or the quilling? Can you tell me the shipping cost? Zip is 01757. WOW! I can't believe the cost difference on this, compared to the "regular 714". If it is as good quality as the "regular industrial 714" then this is an AMAZING price! Glenda, I'd like to order two, but you haven't given me the shipping cost to zip code 01757. Please let me hear from you today! I sent you an email! Thanks!!! Did you receive my email regarding ordering an atg pink gun shipped to 91402? Just sent you an email I had a hard time finding you from the cricut messageboard. Glad I did my zip is 86325. Where are you located? I really want one of these...I emailed you! To everyone who has NOT received an invoice from me yet, because I was sooooo unbelievably buried in email requests for the Pink ATG, I actually have now added the capability for anyone to do their own regular "check-out" through PayPal, right on the page. The checkout capability is on the original post, as well as under the ADHESIVES tab (on the Navigational Bar at the top of my site). If you have NOT yet received an invoice from me, PLEASE use the PayPal checkout I have provided. If you have any questions or concerns after going through the checkout, please email me at glendascreativeplace@yahoo.com . Thanks soooo much to everyone for this amazing response for a FABULOUS cause!!! Hi Glenda! Was wondering if you also offer free shipping if the order reaches a certain amount together with the other products that you sell? Is the Pink ATG in stock ? I am also interested in the ATG. Having experienced adhesive failure with my old brand, and no backups on hand, I need to know if this is available now. And also shipping charges to 70123. Just placed my preorder. So excited that I waited because using the "add to cart" button worked so well. All done and get wait for it to arrive. I have been trying to respond to emails whenever possible, but my "out of town" technology is not working consistently. I've been in contact with the manufacturer constantly, on the phone & in their booth while I was at CHA. They changed the expected arrival date range now to sometime during the 2nd week in August (and again, this IS an estimate from them, they won't guarantee any exact date!!). I have absolutely NO control over 3M & their manufacturing process--I am held hostage to them fixing their quality problem & sending all the products I ordered to me. I can't even BEGIN to explain how INCREDIBLY frustrating this has been for me, & how helpless it has made me feel, despite my multiple calls & contacts with the manufacturer. I can't WAIT to receive these & get them shipped out to everyone who ordered one. There is NO worry about getting a refund if you happened to pick one up locally at the national chain store who received that early shipment (but please, be sure to check EVERYTHING included in your box to make sure it's all working correctly if you did get one, since there have been those quality issues reported within that shipment, which are what caused the delays for everyone else since!!). Hi Glenda. Are these still available for purchase from your site? Has the quality issue been fixed? Thanks so much for your reply. My zip is 87048 so if I can get an estimate on shipping costs, I'd appreciate it. I agree with this program. We can donate our funds to help people who are affected by cancer. Many benefits are we get if we buy this product. I also want to purchase this product transform and share with others. Fun with i-rock and i-top Tools! !